The Sox have been playing pretty good ball lately. They have had their struggles with pitching and scoring runs both, but overall are continuing to hold their own though they at present time are a half game behind the Yankees for the division. 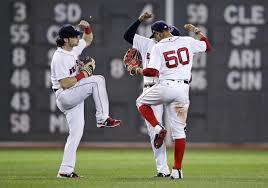 Mookie has come back into his own though he is not quite back to the level he was before his injury. We are looking forward to him returning to great form soon. Martinez has had a good game or two and continues to lead the majors in RBI’s. Devers has hit better the last few weeks and Bogaerts has been contributing quite a bit as well. The rest of the team has been doing pretty well offensively as well. The team is really beginning to take shape with just about everybody contributing up and down the lineup. If they could just get a little more consistent, things would be great. The pitching has suffered a set back or two of late. E-Rod had a rough outing the other day, the worst we have seen him have in a while, but I think he can get it back on track for his next outing. Wright was unable to get his knuckle ball working at all in his last outing and gave up 10 runs in a game that the Sox were still able to win 14-10. Overall the bullpen has still been spectacular and let’s hope things continue to go well there as they have sealed victory many times this year and we need them to continue to do so with shut down innings and zeros on the the board. So, overall, things are looking pretty good going forward. As I have said, it is going to be a real battle to win the division, but we have a series coming up soon against the Yankees that should decide things at least for now. If we can win the series against them perhaps we can go back into the lead and continue to keep pace in what is still a long way to go. The question is whether we can continue to keep up with the Yankees and be in a position to win the division. We don’t want to come in second as then it will all come down to one playoff game even if we do win over a hundred in the regular season. We could just as easily as not lose one playoff game and that would be such a shame after a great regular season. We will see what develops. For now we just need to keep our nose to the grind and play ball. Good things are bound to happen to this team and if we can stay injury free, our talent should get us into the playoffs. We will see what happens from there. Until then let’s just keep plugging along and like a long distance runner or race of any kind, we just need to pace ourselves and keep pace to see if we might pull off the great win at the end. Let’s just keep moving forward! Anyway, Go Sox! This entry was posted in June 2018 and tagged baseball, Just keep the ball rolling Sox!, Red Sox. Bookmark the permalink.